Every day millions of Americans wake up and go to work in an office setting. For many, this means getting up, commuting directly to work, spending up to 8-10 hours hunched at your desk, commuting back home, and then eventually staggering to bed. This routine of spending well over half your waking hours in a sedentary sitting position can cause many health concerns including soreness and pain in the neck and back. While one may consider a comprehensive exercise regimen as a solution to this problem, like many things in life every little bit helps. Even if your building does not have a gym facility or if it is impractical to go for a light jog during lunch, there are a few exercises and stretches you can do seated right at your desk several times a day to combat fatigue and soreness. No gym membership required. Sit in your chair, back straight, and feet flat on the floor. Let your right arm hang at your side. Bring your left hand up and place it on your head, with the elbow pointed left. Very gently pull with your left hand and tilt your head to your left. Keep your torso upright and feel the stretch in your neck. Of course, avoid pulling or straining your neck. Maintain this for about twenty seconds, then remove your hand and slowly lift it back into place. Repeat the stretch on the other side. While in your seat, straighten your back and shoulders. Bring up your right arm and while maintaining a straight back reach your hand beyond your left shoulder. Support your arm by lifting your left hand to your right elbow. Stretch by pulling the elbow into your chest for about twenty seconds, then lower your hands back to your sides. Repeat the stretch on the other side. Sit in your chair in an upright position. Place both of your hands behind your head, interlacing your fingers. Using just the weight of your hands, bow your head and gently draw your chin toward your chest. Lower your head until you can feel the stretch in the back of your neck. Maintain for about twenty seconds, then release your hands. Gently raise your head back up. Doing this one may depend on how close your desk is to your neighboring coworkers’. Scoot your chair away from your desk a bit. Sit up straight and extend your arms out to your sides, so your upper body is in a ‘T’ formation. 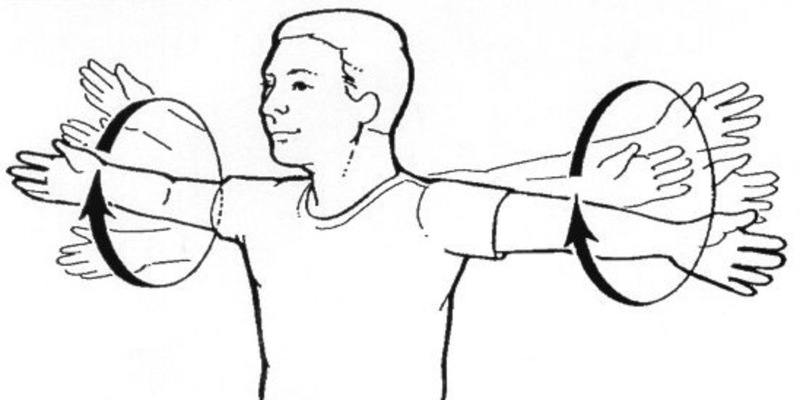 Keeping your torso and elbows straight, slowly rotate your arms in a small circle, as if you were wiping windows on either side of your body. Resist the tendency to shrug your shoulders to your ears, keep them relaxed. Maintain the rotation for about twenty seconds, then gently rotate your arms in the opposite direction. Many of us work all week at an office job. Some of us may even know people who have made life-long careers out of working in an office, all the way up to retirement. If we are not careful all these years of hard work in a mostly sedentary position can cause problems starting with basic back pain and stiffness and lead to more severe health issues the further we go. For many, this culture of hustle and work can make it difficult to find time to hit the gym. Fortunately, there are steps and measures you can take at the very desk you work at that can help ensure you stay loose and prepared to face your work week head on.